Sunday 30th November – 9.50pm – Suzie Wheaton. 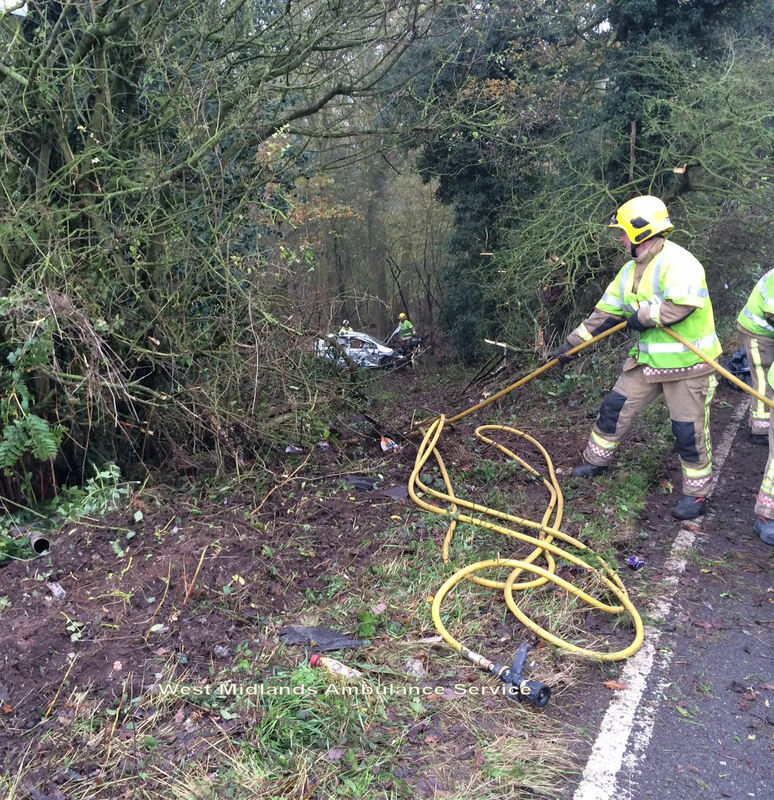 Two people have received emergency medical treatment following a road traffic collision in Bewdley today. West Midlands Ambulance Service was called to the incident near to the junction of Heightington Road and the A456 in Ribbesford at approximately 6.00pm this evening. Two ambulances, two paramedic officers in rapid response vehicles, a rapid response vehicle from the Midlands Air Ambulance base in Strensham and the Trust’s MERIT rapid response vehicle, carrying a trauma doctor and a critical care paramedic were dispatched to the scene. A spokeswoman for West Midlands Ambulance Service, said: “Crews were called to reports of a two car road traffic collision. “On arrival at the scene crews found a man, believed to be the driver of one of the vehicles out of his car and a woman of a second car who was trapped in her vehicle. “The man was treated at the scene for facial injuries. He was immobilised and conveyed to a specialist unit at Queen Elizabeth Hospital in Birmingham for further assessment and treatment. “Emergency services worked closely together for approximately an hour and a half to safely extricate the woman from her vehicle. The woman was treated for leg, pelvic and spinal injuries. She was given pain relief and fully immobilised at the scene. 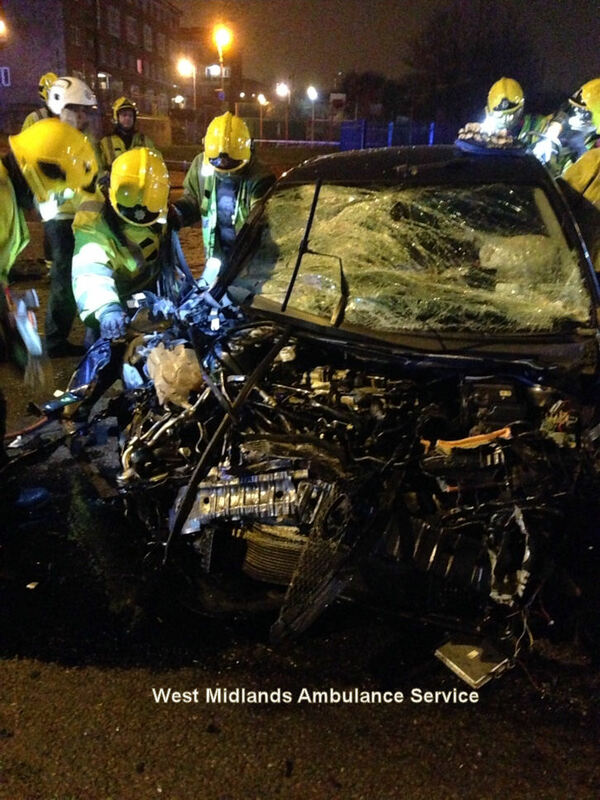 “The woman was conveyed to the major trauma centre at Queen Elizabeth Hospital Birmingham. The hospital was pre-alerted and medics were on standby. Sunday 30th November – 7.00pm – Suzie Wheaton. A man had to be rescued today after he injured his leg whilst walking in the Malvern Hills. West Midlands Ambulance Service sent one ambulance and an officer in a rapid response vehicle to the scene. The fire service was also in attendance. A West Midlands Ambulance Service spokeswoman said: “Crews were called to reports of a man who had fallen on the hillside near to St. Ann’s Road shortly after 11.55am this morning. Friday 28th November – 7.40pm – Suzie Wheaton. A motorcyclist has received emergency medical treatment from ambulance crews following a road traffic collision in Shropshire today. West Midlands Ambulance Service sent an ambulance and two rapid response vehicles; one from the Midlands Air Ambulance base in Cosford, carrying a critical care paramedic and trauma doctor, to the incident at the junction of the B5061 and the B4394 in Wroexeter and Uppington, Norton shortly before 1.20pm this afternoon. A spokeswoman for West Midlands Ambulance Service, said: “Crews arrived to find a car and a motorbike that had been in collision. “The motorcyclist, a man in his 20’s, was treated for pelvic and leg injuries. 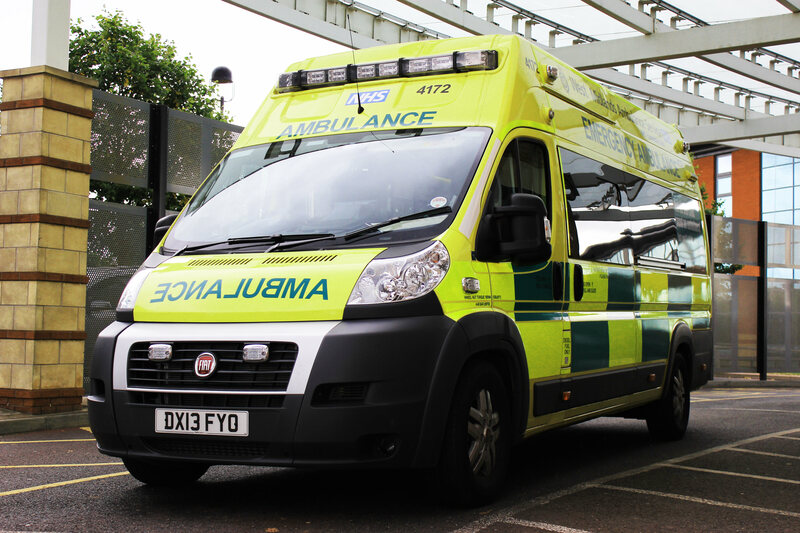 He was given advanced pain relief at the scene and fully immobilised before being conveyed to the major trauma centre at Queen Elizabeth Hospital Birmingham. Friday 28th November – 9.30pm – Suzie Wheaton. A woman has been treated after the car she was travelling in left the carriageway and collided with a wall. West Midlands Ambulance Service dispatched an ambulance, a senior paramedic officer, a BASICS Doctor, the Trust’s MERIT team and a rapid response vehicle from the Midlands Air Ambulance base in Cosford to the incident on the B4368 in Diddlebury, Craven Arms at approximately 6.15pm this evening. A West Midlands Ambulance Service spokeswoman said: “Crews arrived on scene to find a car that had left the carriageway and had collided with a stone wall at the bottom of an embankment. “Emergency services at the scene worked together to help free the woman, who was trapped in her vehicle for over an hour. The woman, believed to be 21 years of age, was treated for injuries to her head, pelvis and leg. “She was given advanced pain relief at the scene and was fully immobilised before being conveyed to the major trauma centre at Queen Elizabeth Hospital in Birmingham. Friday 28th November 2014 – 3.15pm – Chris Kowalik. Another area of the Shropshire Hills is about to get a vital piece of lifesaving equipment. A defibrillator, a device that could restart the heart of someone who suffers a cardiac arrest, is due to be fitted outside All Stretton Village Hall, thanks to donations and support from the former All Stretton Amateur Football Club, Shropshire Council, British Heart Foundation and local residents. This is in addition to another community defibrillator due in nearby Church Stretton in the New Year. Training for the device in All Stretton will be provided by West Midlands Ambulance Service in the Village Hall at 9.45am on Sunday 7th December. Following the training session, the defibrillator will ‘go live’ that same day, ready for use in the event of a cardiac arrest and while an emergency ambulance vehicle is en-route. If you would like to learn how to save a life, contact David Williets on 01694 722112 or d.williets@virgin.net. Friday 28th November 2014 — 2pm – Steve Parry. West Midlands Ambulance Service (WMAS) has been shortlisted for two prestigious honours at the forthcoming Health Business Awards. The Trust has been shortlisted in the category of Ambulance Service Trust of the Year together with an Outstanding Achievement in Healthcare Award for its highly regarded Regional Trauma Network Response. 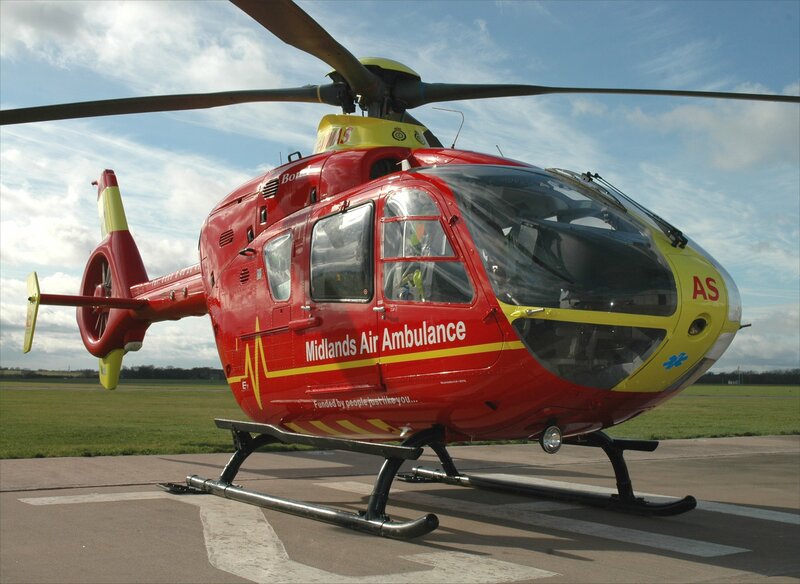 Our health partner, Midlands Air Ambulance Charity is also shortlisted for Air Ambulance of the Year. WMAS is recognised as one of the highest performing ambulance trusts in England and over the past twelve months has delivered its ‘Make Ready’ programme; recruited over 300 new paramedics and stepped-in to successfully manage the NHS 111 service for the majority of the West Midlands region. 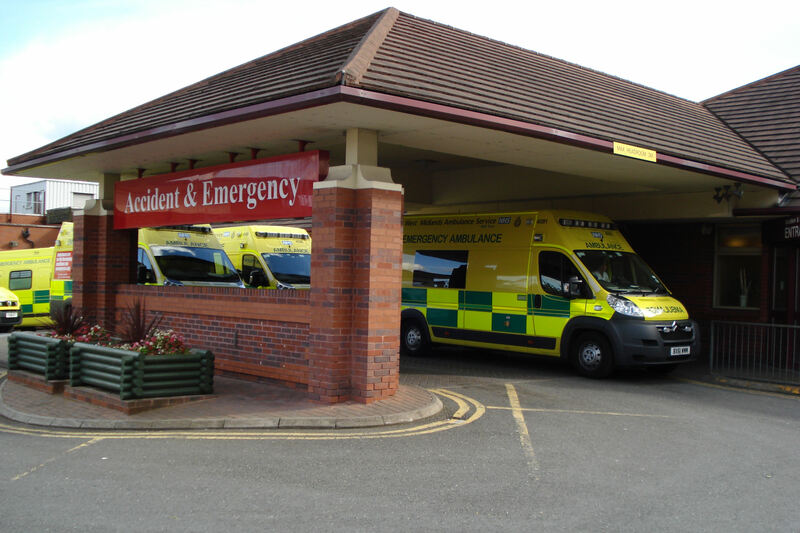 The Trust has also established a dedicated Regional Trauma Desk in its Emergency Operations Centre in Brierley Hill as an integral part of the Regional Trauma Network Response. The desk is operated by highly skilled paramedics and combines with medical support from the Medical Emergency Response Intervention Team (MERIT) which includes trauma trained doctors and advanced paramedics. The response to seriously injured patients is currently acknowledged as the best developed in England and represents a new approach to trauma care in the region, recording over 80 additional patient survivors. The MERIT team has attended over 3,500 cases with nearly 2,000 cases triggering a trauma alert since going live in March 2012. Representatives from the Trust will be attending the awards on December 4th in London. Friday 28th November 2014 – 10.00am – Claire Brown. 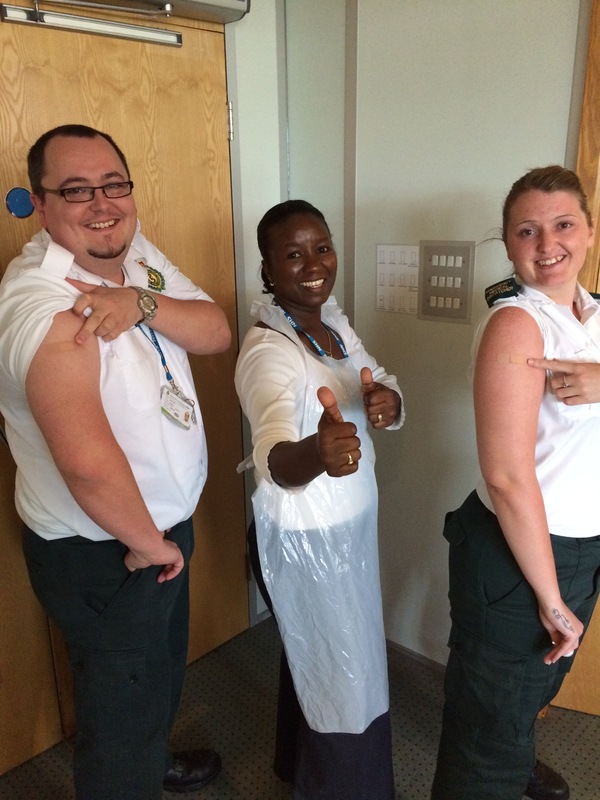 More than 1,300 ambulance staff have become ‘flu fighters’ by getting their free flu jab to protect themselves, their patients and their families this winter. 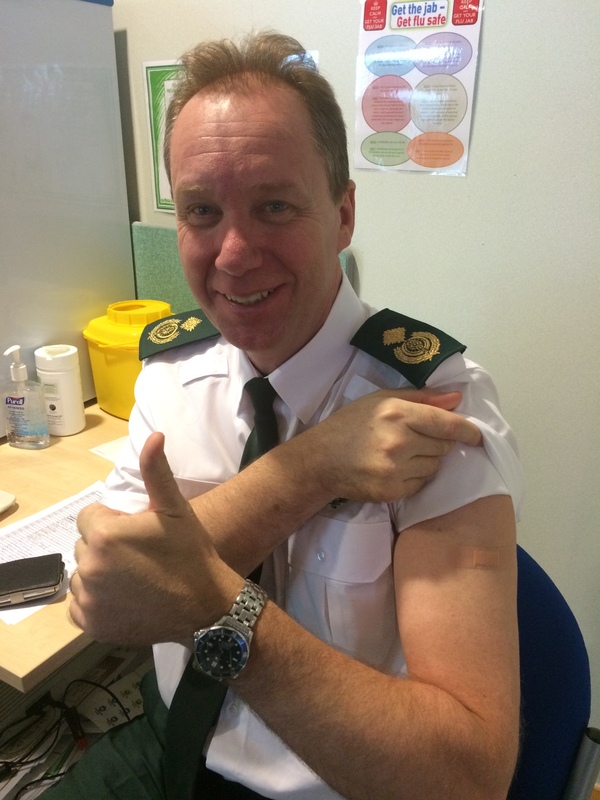 The Trust’s flu vaccination programme is well underway to protect our staff. Flu doesn’t care who it infects and we’re urging the public to protect themselves with a simple flu jab to prevent missing out on the fun during the festive season. For most healthy people there’s no question it’s unpleasant but with good self-care you can start to feel better after about a week. For older people, the very young, pregnant women and those with chronic respiratory or cardiovascular health problems, it can sometimes be a lot worse. If I get the flu, what can I expect? Expect a high temperature (more than 38 degrees Celsius) and a sudden cough. Other symptoms can include headache, feeling cold and shivery, aching muscles, limb or joint pain, sore throat, runny nose, sneezing, loss of appetite and diarrhoea or an upset stomach. What can I do to get better at home? If you’re otherwise fit and healthy, there is no need to visit your GP with flu-like symptoms. The best thing you can do is rest, drink plenty of fluids and help ease a sore throat with cough lozenges, mixtures or sprays. If you are buying over the counter remedies, make sure you check with the pharmacist first to ensure they don’t affect medication you’re already taking. Friday 28th November 2014 – 8.30am – Steve Parry. West Midlands Ambulance Service can confirm it attended a fire in an apartment above a shop in The Horsefair, Kidderminster at just after 9.50pm (Thursday). Three ambulances together with two paramedic officers, the MERIT team and the Hazardous Area Response Team (HART) attended the scene. Robert Marsh, Area Manager for West Midlands Ambulance Service, said: “A woman and a boy, believed to be mother and child, were treated at the scene before being transferred to hospital. Friday 28th November – 7.00am – Suzie Wheaton. A woman has received emergency medical treatment when her arm became trapped between her car roof and the road after her vehicle overturned. West Midlands Ambulance Service dispatched an ambulance, a rapid response vehicle, a paramedic area support officer and a BASICS Doctor to the incident on Solihull Road in Hampton in Arden at approximately 10.45pm last night. A West Midlands Ambulance Service spokeswoman said: “Crews arrived on scene to find a car that had overturned on to its roof. The driver, who was the single occupant of the vehicle, was found to be trapped upside down with her right arm trapped between the roof of the car and the road surface. “Ambulance crews worked closely with the fire service to safely extricate the woman from the vehicle, which was also found to be leaking fuel. “Once freed, the woman believed to be approximately 22 years of age, was treated for an isolated arm injury. Due to the nature if the incident, she was fully immobilised and given pain relief at the scene. Wednesday 26th November – 6.45pm – Suzie Wheaton. Almost 40 people, including 34 school children, were involved in an incident on the M40 this evening. West Midlands Ambulance Service was called to the southbound carriageway of the M40 between junctions 16 – 15, shortly after 4.40pm today. Two ambulances, five ambulance officers in rapid response vehicles, the Hazardous Area Response Team, a BASICS doctor, and the Trust’s MERIT rapid response vehicle, carrying a critical care paramedic and a trauma doctor, were dispatched to the scene. A spokeswoman for West Midlands Ambulance Service, said: “We were called to reports of a large number of patients who had potentially suffered the effects of smoke inhalation after smoke from the vehicle was believed to have entered the passenger cabin. “A total of 34 school children, 4 members of staff and the coach driver were all off the vehicle on the crew’s arrival and were safely on the embankment away from the carriageway. “Fourteen children, believed to be between 11 and 12 years of age, were assessed for the effects of smoke inhalation, two of which required oxygen therapy at the scene. “All 14 children had their carbon monoxide (co2) levels assessed by ambulance crews before being discharged at the scene with no one requiring any further hospital treatment. Wednesday 26th November – 12.20pm – Jamie Arrowsmith. 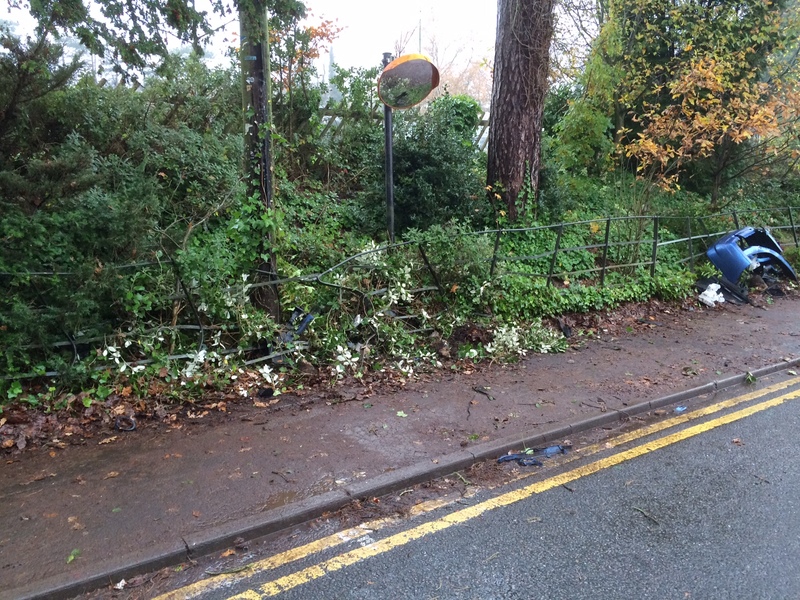 Three girls have had an incredibly lucky escape after they were in collision with a car in Edgbaston. The incident happened at the junction of Somerset Road and Edgbaston Park Road shortly before 10.20am and West Midlands Ambulance Service sent one ambulance to the scene. A West Midlands Ambulance Service spokesman said: “The three Birmingham University students were walking to class when the car lost control, spun and collided with railings twice before coming to rest 50-yards further up the road. “In the process, the car clipped the three students. “Amazingly none of them suffered serious injuries. The 18, 20 and 21-year-olds all suffered minor leg injuries. They were assessed by the crew but were discharged at scene. “The driver, a 20-year-old man, was uninjured. Wednesday 26th November 2014 – 10.15am – Suzie Wheaton. When Stoke-on-Trent Ambulance Technician, Mark Mitchell, hangs up his uniform at the end of his shift he is often found reaching for his Marshalling overalls. Forty-eight year old Mark from Stoke-on-Trent can regularly be found at the side of the race track, with one of his most recent experiences being in America, marshalling at the US Grand Prix in Austin, Texas. Mark has been a volunteer motor-racing marshal for over 20 years and is a qualified Examining Post Chief. The Post Chief role encompasses a whole range of duties including mentoring less experienced marshals, firefighting skills, first aid, communications, enforcing regulations and actioning emergency responses to incidents. Over the years Mark has marshalled at around 16 Formula One events. 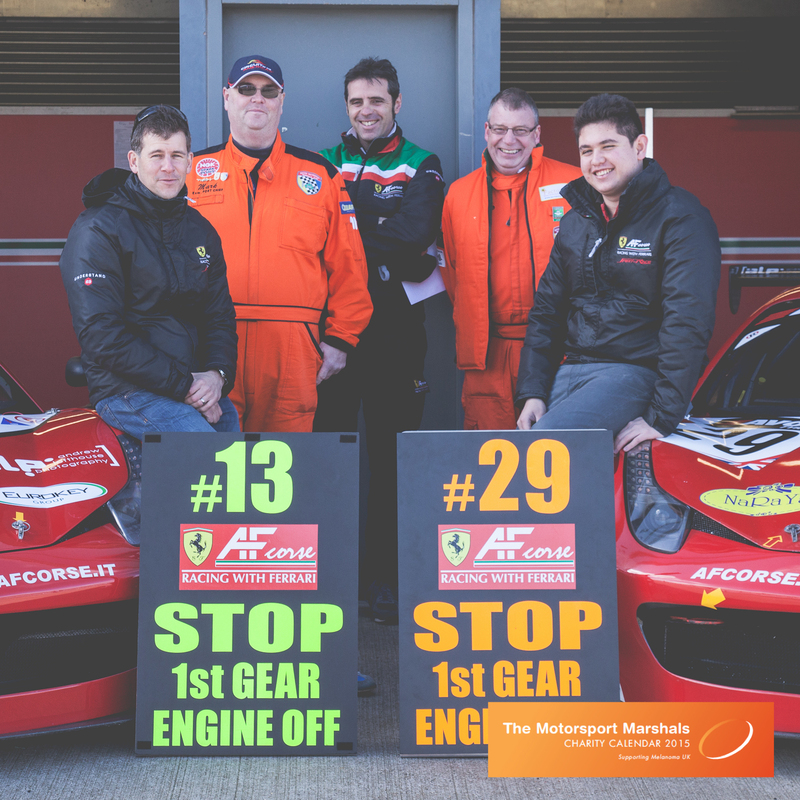 This year alone, he has headed up crews comprising of marshals from the USA, Canada, Monaco, Brazil and India, as well as carrying out at least 30 more days marshalling at most UK circuits. Talking about his marshalling, Mark said: “Motor racing is an extremely expensive sport and therefore it’s difficult to compete myself. Marshalling allows me to still be very close to the action and be part of a sport that I love. “Over the years I’ve met some wonderful people including some drivers, a number of which have gone on to be quite successful, including two ex, and one current Formula One World Champion. “My first F1 experience was at Silverstone in the 90’s whilst working for my local radio station, and I suddenly found myself in a melee of other journalists posing questions to Michael Schumacher and Johnny Herbert. This year, Mark has also had the privilege of being been involved in a charity project to raise funds for skin cancer charity, Melanoma UK. The project saw him being photographed alongside the likes of Damon Hill, Bruno Senna and Martin Brundle for a charity calendar*. Anyone interested in finding out more about the project can visit http://www.charitymarshal.org. Calendars can be ordered via http://www.andrea-pennington.com at a price of £10 including postage and packing. Picture: Mark pictured in orange, second from left. If used, the picture must be credited to Andrea Pennington. * The Marshals Charity Calendar 2015 is the brain child of Oulton Park based marshal and BRSCC North region race secretary, Paul Sutcliffe. Paul has been a lover of all motorsport since he was a small boy and a marshal for the last 8 years. In 2008 he was diagnosed with stage 3 Malignant Melanoma which has been removed and since returned twice, following major operations to remove it. Malignant melanoma is prevalent amongst groups who spend a lot of working time outdoors, like motorsport Marshals. Since having the disease, Paul has been involved in a charity called Melanoma UK and has wanted to create a marshal based charity calendar. Now alongside Motorsport PR photographer Andrea Pennington and Photographer Gaynor Stocker it has all become possible. Designed by Faye Neo, the calendar will be A4 and open up in to A3 size. All monies raised will go to the Melanoma UK charity (www.melanomaUK.org.uk). Wednesday 26th November – 10.25am – Jamie Arrowsmith. Three people have been taken to hospital, one of whom had to be cut free from her vehicle, following a four-car collision on the M40 this morning. West Midlands Ambulance Service was called to the southbound carriageway, between junctions 14 and 13, shortly before 6.55am and sent three ambulances and a paramedic area support officer to the scene. Tuesday 25th November 2014 – 2.30pm – Steve Parry. A pedestrian has been taken to hospital following a road traffic collision in Wolverhampton this afternoon. The incident occurred on Snow Hill in the city centre at just before 1pm. An ambulance together with a paramedic officer in a rapid response vehicle and the Midlands Air Ambulance crew travelling in a response car attended the scene. A West Midlands Ambulance Service spokesman said: “Crews arrived to find a pedestrian had been in collision with a car. “A man in his twenties was treated for head injuries and a fractured leg. “The patient was immobilised with the use of splints, a neck collar and placed on a spinal board before he was conveyed to the Queen Elizabeth Hospital in Birmingham further assessment and treatment. Luck escape for driver after his van collided with a lorry on M40 near Warwick. He was treated on scene for a thumb injury. Tuesday 25th November 2014 – 9.15am – Murray MacGregor. A West Midlands Ambulance Service paramedic, who has just flown out to Sierra Leone says that although he’s nervous, being able to work in such circumstance is some of the most rewarding type of care you can give. 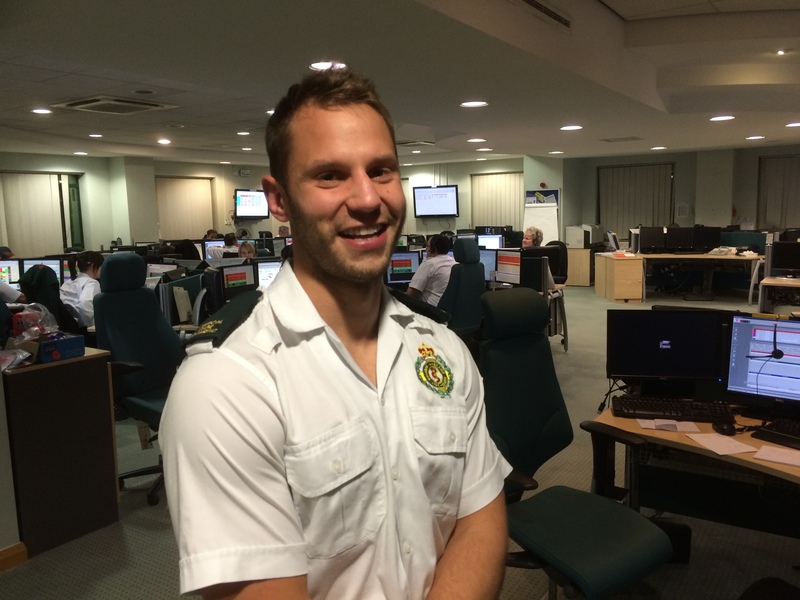 Tom Waters is one of two members of staff who are now making final preparations before starting to treat patients in the West African country. Tom, along with Lichfield based paramedic, Gerard Kelly are among 30 NHS staff who flew out over the weekend. About 1,000 NHS staff volunteered and have been through the selection and training programme in Yorkshire. They will work in treatment centres being built by the UK military and run by charities. Speaking before he went, Tom said: “I’ve done some volunteering in Cambodia in the past and I found it to be the most rewarding type of care. This opportunity has arisen where I really think I can make a difference. “I’ve got enough support from my family and my girlfriend, even though I’ll miss her birthday, and they’ve encouraged me to do this; I’d really like to make a difference and help people. 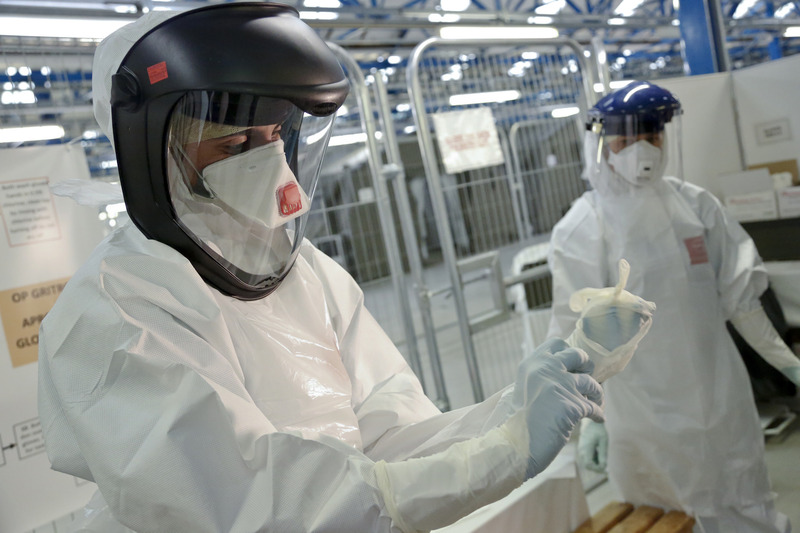 “We will get a lot of support from the military and NHS but one of the challenges will be the sheer volume of patients that we’ll actively have to treat. This includes lots of children who are getting badly dehydrated and struggling with this. Tom is currently a critical care paramedic who works on the Midlands Air Ambulance based at Cosford flying with doctors to trauma patients across the whole of the West Midlands. The 27 years old has been a paramedic for seven years after graduating from Coventry University. He has also been based in Telford, and Birmingham. The Department for International Development Press Office is on 020 7023 0600. Monday 24th November 2014 – 6.55pm – John Hawker. One man has died after a car left the road and collided with a wall in Leek Road, Cheadle at around 3.20pm this afternoon (Monday). One ambulance, a rapid response vehicle, a paramedic officer, two Midland Air Ambulances and two BASICS Doctors attended the scene. 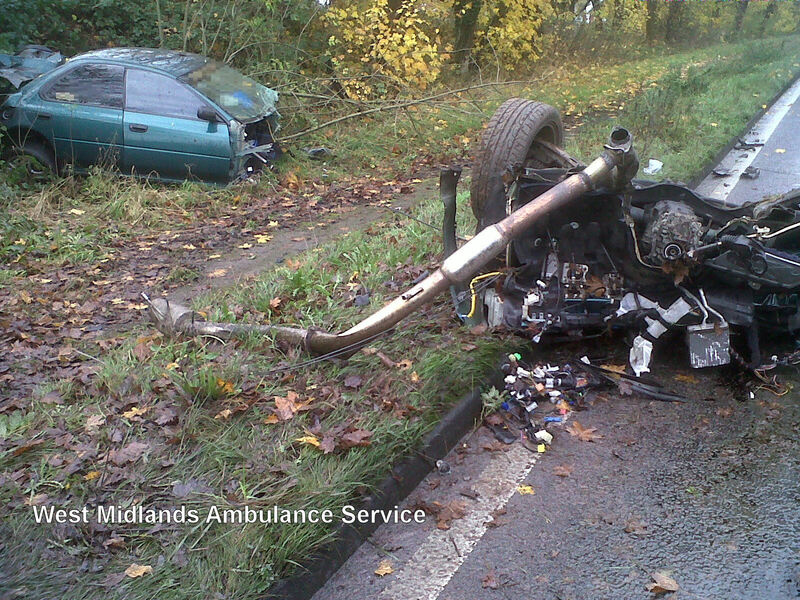 A West Midlands Ambulance Service spokesman, said: “Crews arrived to find a car that had been in collision with a wall. A second car that had been parked nearby had also been damaged, though no-one was in it at the time. “It is believed the man driving the first car had suffered a medical event at the wheel and was in cardiac arrest when crews arrived. “Resuscitation attempts were carried out at the scene with ambulance staff using advanced life support techniques. Monday 24th November 2014 – 11.10am – Murray MacGregor. Staff are being praised for maintaining a safe 999 service despite over two thirds taking some form of industrial action. Of the staff on duty, 41% took full strike action while another 26% worked to a number of exemptions meaning they only responded to the most serious calls where life was at risk. West Midlands Ambulance Service Chief Executive, Anthony Marsh, said: “Taking strike action is a very difficult decision for our staff. However, through a combination of pre-planning and agreements with union representatives, we have been able to maintain an emergency service for the most seriously ill and injured patients. “Our staff work extremely hard in often very difficult circumstances and we have sympathy for their position. “Although the strike action is over, action short of a strike will continue throughout the week. This means it continues to be vital that the public recognise the increased pressure that the service is under. Sunday 23rd November 2014 – 11.20pm – Jamie Arrowsmith. Two men have suffered serious burns injuries following an explosion at a property in Birmingham tonight (Sunday). West Midlands Ambulance Service was called to Aldersmead Road, Northfield, just after 8.10pm and sent two ambulances, a paramedic area support officer, a senior ambulance officer, a MERIT trauma doctor and the Trust’s Hazardous Area Response Team to the scene. The police and fire services were also in attendance. “The first patient, a man in his 30s, was treated for burns to his arm, head and back. 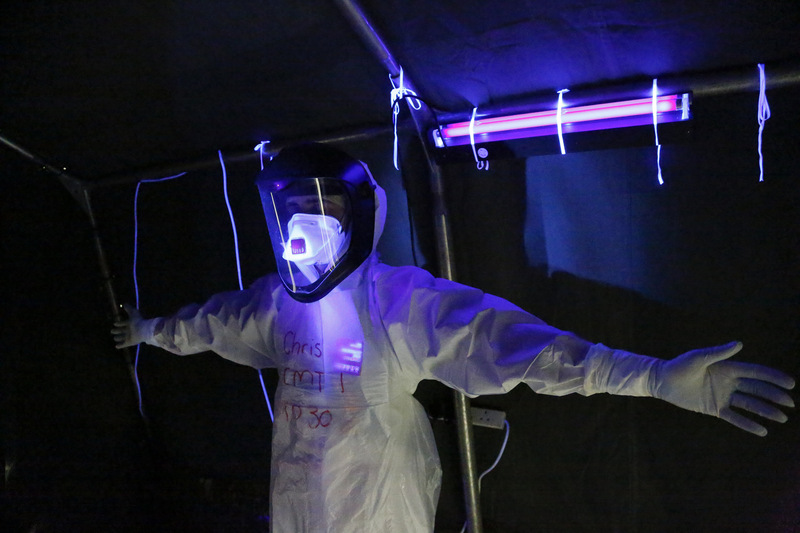 “The second patient, a man in his 20s, was treated for burns to his back, neck, hands and arms. “Both patients were given pain relief on scene before being transferred to Queen Elizabeth Hospital Birmingham. “A third patient from a nearby property was assessed on scene but did not require hospital treatment. Sunday 23rd November 2014 – 2pm – Chris Kowalik. A man has died and two people have been injured in a road traffic collision. West Midlands Ambulance Service was called to reports of a two-car collision at the junction of the A4123 and Bleakhouse Road, Warley, shortly after 9.20am today. An advanced community paramedic in a rapid response vehicle, a paramedic area support officer in a rapid response vehicle and two ambulance crews attended. A West Midlands Ambulance Service spokesman said: “One of the drivers was sadly confirmed dead at the scene. “A man who was driving the other car had knee pain. He was treated at the scene and taken to Sandwell Hospital. Saturday 22nd November 2014 – 4.40pm – Chris Kowalik. Five people have been taken to hospital, two with serious injuries, following a collision involving a car and a bus in the Black Country. 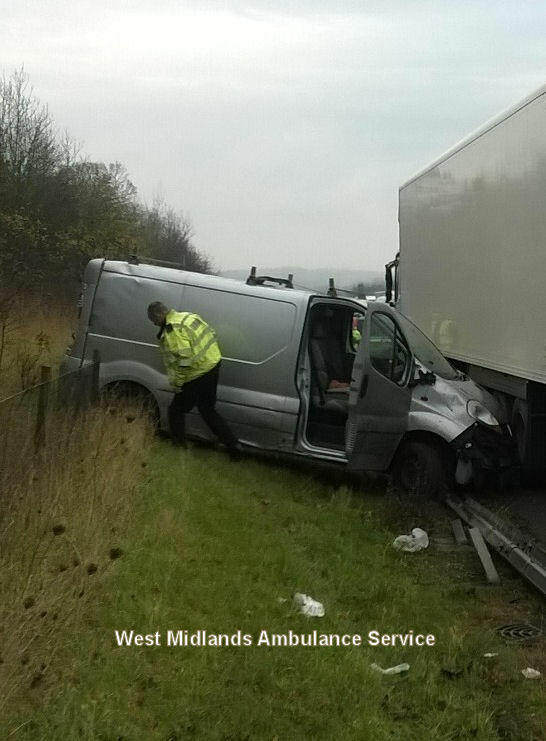 West Midlands Ambulance Service was called to Toll End Road, Tipton shortly after 1.20pm today. Five ambulance crews attended along with the crew of Warwickshire and Northamptonshire Air Ambulance who came by rapid response vehicle, the Midlands Air Ambulance from Cosford, a paramedic area support officer in a rapid response vehicle and the Hazardous Area Response Team. A West Midlands Ambulance Service spokesman said: “A man and a woman who were in the car were cut free with the help of the fire service. The male driver had a head injury. A woman passenger had head, facial, back and chest injuries. Both were anaesthetised at the scene and their airways maintained. The woman was flown to Queen Elizabeth Hospital Birmingham. The man was taken to the same hospital by land ambulance. Saturday 22nd November 2014 – 3.20pm – Chris Kowalik. A man and two children appear to have escaped serious injury after the car they were in left a main road and split in two. West Midlands Ambulance Service was called to Fletchamstead Highway in Coventry shortly before 11.40am today. A West Midlands Ambulance Service spokesman said: “The man and both children got out of the vehicle and, other than a couple of minor scratches, were uninjured. Saturday 22nd November 2014 – 11.50am – Chris Kowalik. 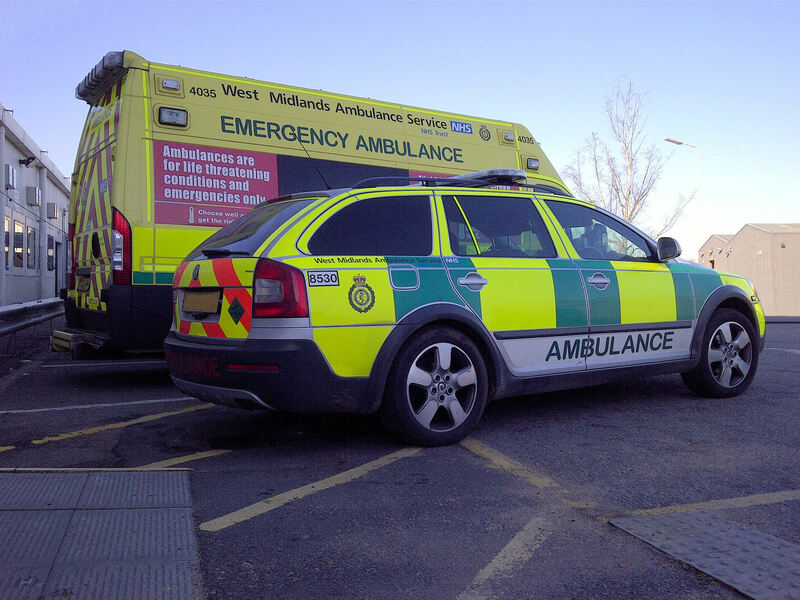 A national telecommunications fault has resulted in most calls to NHS 111 call centres in England, including that run by West Midlands Ambulance Service, not being connected. The telecoms provider is aware of the problem and is working to fix it. The call centres continue to be fully staffed, however, only a few calls are making it through to them. Callers to 111 will hear a recorded message giving the alternative number of 0300 0200 155, which is an interim attempt by the telecommunications company to temporarily by-pass the problem and forward the call to any of the call-centres. A spokesman from West Midlands Ambulance Service said: “This problem, which arose this morning, is beyond our control. Our health advisers and clinicians are in the call centre to answer any calls that can get through. “Please, in the first instance, try calling 0300 0200 155. “If your call is unable to be connected to us, please try using a walk-in centre, minor injury unit or urgent care centre for advice or assistance if available. Or visit your local pharmacy. Ambulance bosses are warning that a second day of national strike action, which will affect all ambulance services, could have a much bigger affect than the first with long delays. West Midlands Ambulance Service is expecting a large number of staff to walk-out between 7.00am and 11.00am on Monday 24th November as part of a national dispute with the Government over pay. The concern is that the level of disruption will be considerably bigger than that experienced on Monday 13th October. This will result in significant delays of up to four hours in an ambulance arriving at less serious cases, or to cases such as elderly people who have fallen with a broken hip, abdominal pain or headaches. In some cases which are not genuinely life-threatening, the difficult decision will have to be made not to send an ambulance at all. The Trust has agreed with local unions measures to preserve a service to the patients most in need but is appealing to the public not to call 999 unless it is absolutely necessary. If you call 999 during the strike, unless it is genuinely life-threatening, you could put the lives of those in greatest need at risk. A ballot of Unison, Unite and GMB members voted to take industrial action as a result of the government’s decision to not apply a 1% pay award in full to all NHS staff in accordance with the national public sector pay review body’s recommendations. In addition to the four hours of strike action on Monday 24th November, members of Unison and GMB will also take action short of a strike for the rest of the week. Members of Unite will work to rule until January 18th.This additional action will reduce the number of ambulances and rapid response vehicles available to respond to 999 emergencies across the West Midlands. This will mean slower responses during this time. West Midlands Ambulance Service staff who are members of any of those three unions have the right to take part in industrial action, including strike action. Thursday 20th November 2014 – 5.15pm – Claire Brown. 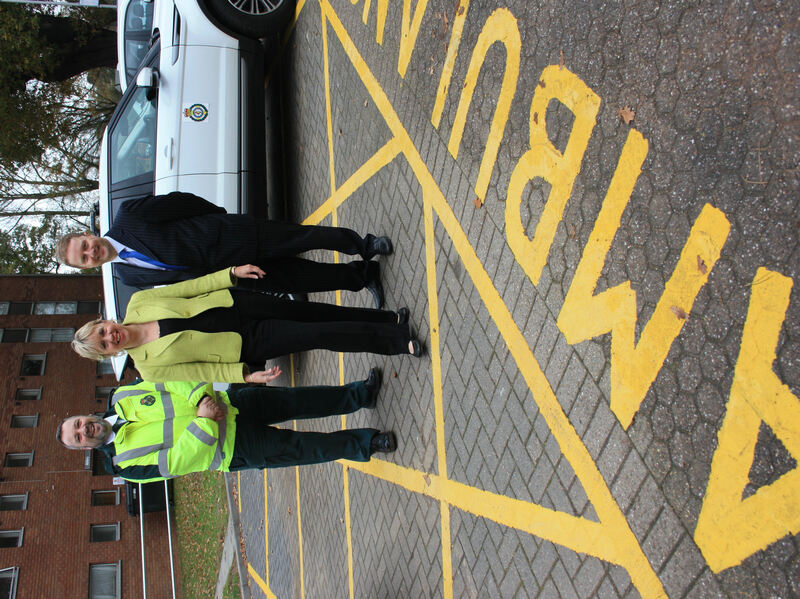 A dedicated community ambulance station, home to 20 ambulance staff, opened its doors in Solihull last week. Based on the Solihull Hospital site, the community ambulance station officially became operational at 6.45am on Wednesday 12th November. It has modern facilities for 20 staff and dedicated parking spaces for two ambulances which will be operational 24 hours a day, seven days a week to serve the local area. The opening of this new station follows the Trust’s Make Ready project to overhaul and modernise the ambulance service in the West Midlands. 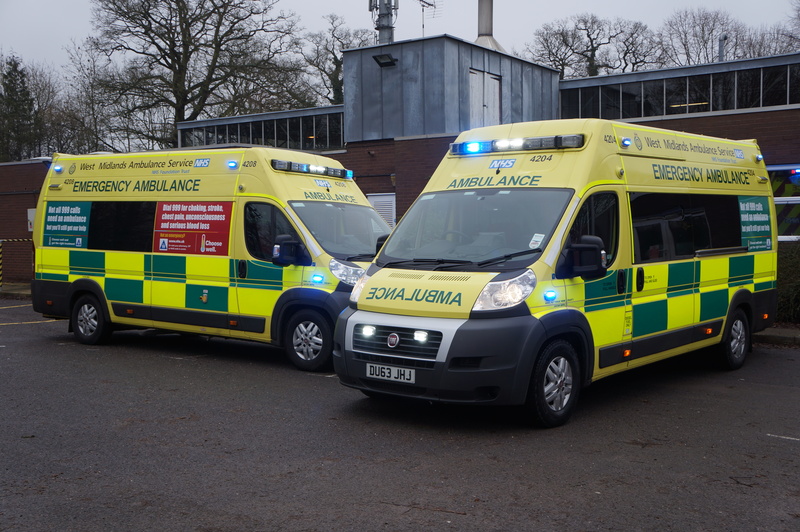 The Make Ready project involved the creation of new hubs and the sale of traditional ambulance stations including that in Hermitage Way in Solihull, which have been replaced by various smaller, lower maintenance and lower cost community ambulance stations such as that at Solihull Hospital. Ambulances are prepared at Erdington Hub, which opened in September 2013, and then dispersed to these community ambulance stations from where they respond to 999 calls. 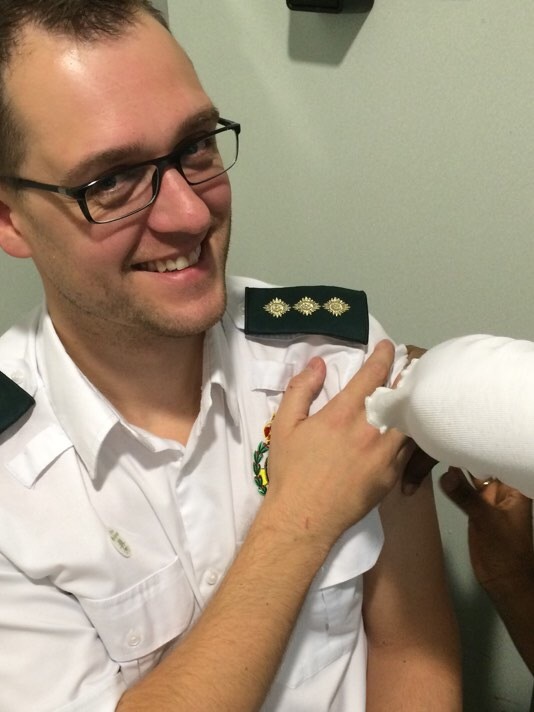 Dean Jenkins, the Trust’s Area Manager for the North of Birmingham, said: “When we introduced make ready we always said that we would monitor the situation to ensure patients got a better service than the previous arrangements. In line with that commitment, we have opened this new facility to further enhance and refine Make Ready and the service we provide to patients. Pictured (left to right) – Dean Jenkins, Lorely Burt and Andrew Clements. Thursday 20th November 2014 – 10.50am – Claire Brown. 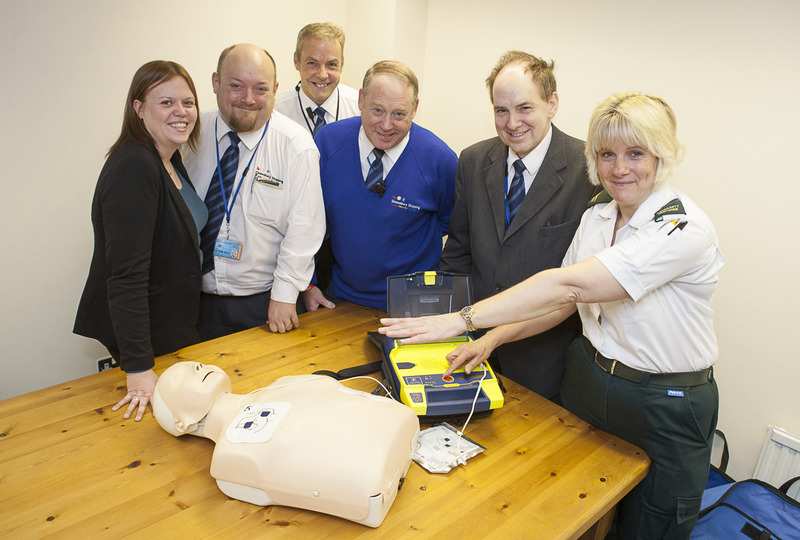 Residents in Balsall Common are never too far away from a piece of life saving kit thanks to four local organisations. A new community Public Access Defibrillator (CPAD) has taken up residence in the village to help save lives. Located in a metal yellow box on the wall outside Unity Carstins showroom in Station Road, the defibrillator was purchased by Balsall Common Lions, the heated box was installed free of charge by John Sleath from a local business called ‘The Job Squad’ and the installation was facilitated by FastAid Community First Responder Jeff Way. This is the second CPAD site in Balsall Common and others are planned for the future. 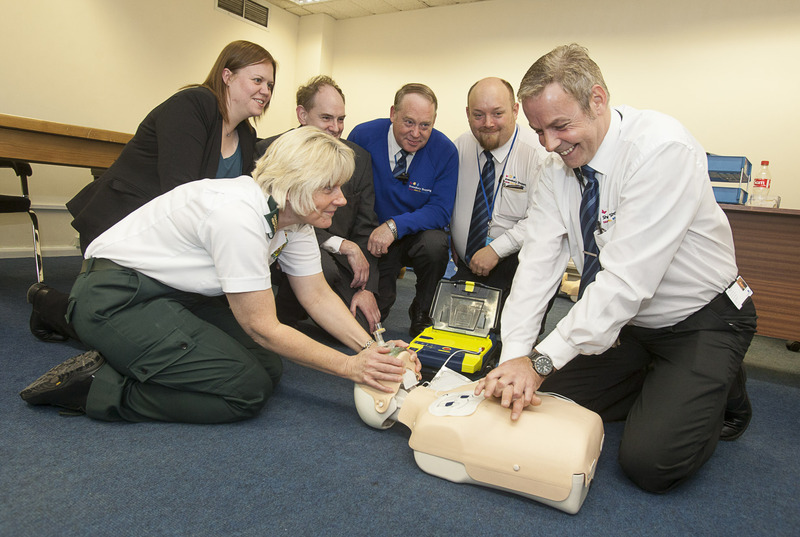 Staff at Carstins will be trained by FastAid in Life Support, CPR and the use of the Defibrillator by FastAid to join more than 100 Balsall Common residents who have already been taught lifesaving skills. Thursday 20th November 2014 – 7.30am – Steve Parry. Three teenagers have been taken to hospital following a road traffic collision near Evesham this morning. West Midlands Ambulance Service was called to Harvington Lane, Norton, near Evesham at just after 1.05am. Three ambulances, a paramedic officer, a paramedic in a rapid response car and the Merit team attended the scene. A West Midlands Ambulance Service spokesman said: “Crews responded to an incident involving a single car which apparently left the road and cleared a fence before ending up in a field. “It is though all three occupants were ejected from the vehicle. Crew treated a female passenger, believed to be 19 years old, for pelvic and wrist injuries. She was immobilised with the use of a splint, neck collar and spinal board before being conveyed to the Queen Elizabeth Hospital in Birmingham. “A second female, believed to be 18 years old, received back injuries. She was also conveyed to the Queen Elizabeth Hospital. Wednesday 19th November 2014 – 5.15pm – Chris Kowalik. 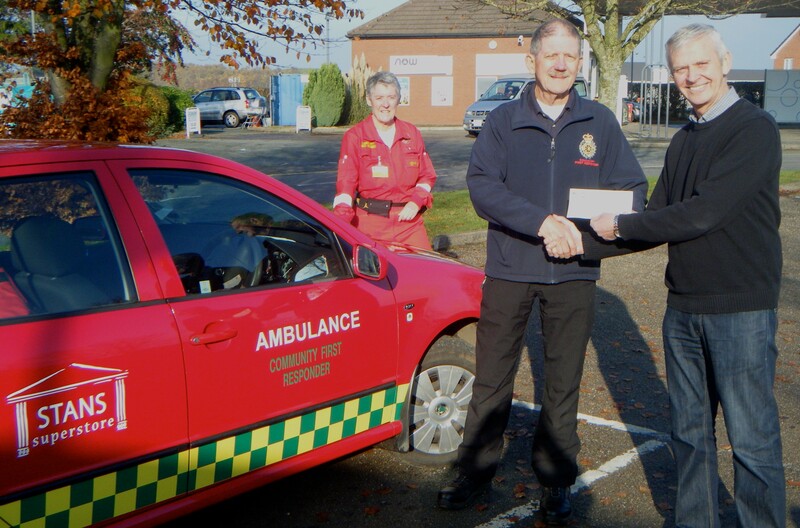 Community First Responders in St. Martins in Shropshire would like to thank a local business for their continued, longstanding support following their latest donation. Stans Superstore which had earlier helped the volunteer group buy their first response vehicle, has now donated £500. Rob Faulks, joint owner of the store, is pictured presenting the cheque to Community First Responder John Roberts MBE, joined by CFR Effie Cadwallader. Wednesday 19th November– 5.00pm – Suzie Wheaton. 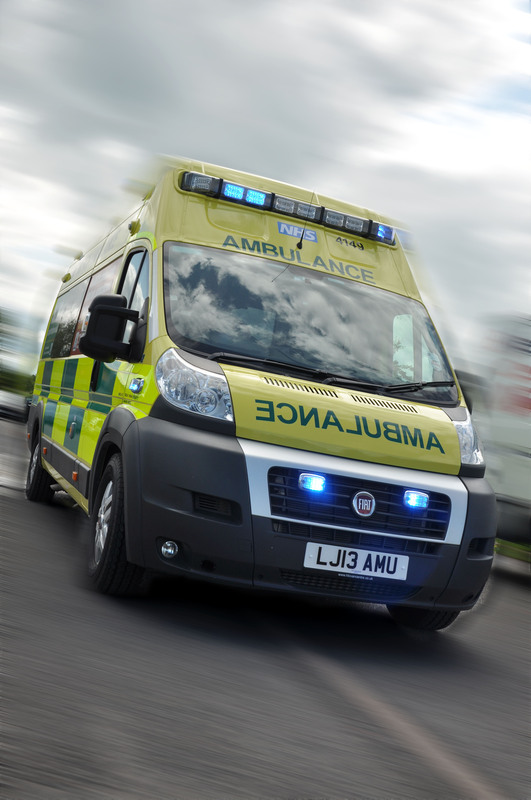 Two women have been treated for injuries following a collision in Staffordshire today. West Midlands Ambulance Service was called to Horninglow Road North in Burton on Trent shortly before 1.45pm this afternoon. Two ambulances, a paramedic officer and the Midlands Air Ambulance from Staffordshire were sent to the scene. 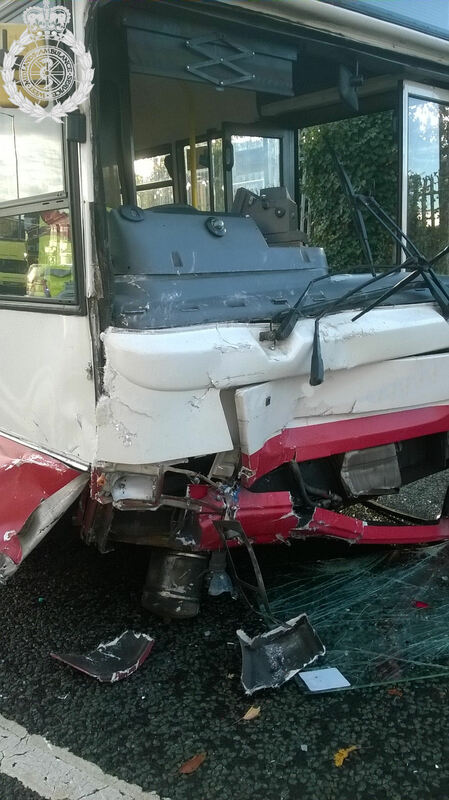 A West Midlands Ambulance Service spokeswoman said: “Crews arrived to find two cars that had been in collision. One of the vehicles had also collided with traffic lights at the scene. “The driver of one of the cars, a woman believed to be in her 40’s, was found to have a reduced level on consciousness. The woman was treated at the scene before being airlifted to the Royal Stoke University Hospital for further assessment and treatment. The machine at Thomas Adams School in Wem was paid for with money raised at a charity football match in memory of Gareth Utting. West Midlands Ambulance Service provided the free training. Wednesday 19th November – 1.30pm – Suzie Wheaton. Four people have received emergency medical treatment after being involved in a road traffic incident this morning. West Midlands Ambulance Service was called to the A34, near to the One Stop shopping centre in Perry Barr shortly before 11am. Three ambulances, a rapid response vehicle, two senior paramedic officers and the Midlands Air Ambulance from Cosford were dispatched to the scene. A West Midlands Ambulance Service spokeswoman said: “Crews were called to an incident involving two cars. On arrival at the scene one of the vehicles was found on its side and a second had sustained significant damage. “The occupants from the car that was found on its side, a man and a child believed to be approximately 10 years of age, were out of the vehicle on the crew’s arrival. “The man and girl were assessed by ambulance crews at the scene and fortunately were found to have not sustained any serious injuries. Due to the nature of the incident both casualties were conveyed within the same ambulance to City Hospital. “The occupants from the second car were trapped for a period of time. Ambulance crews worked closely with the fire service to safely extricate the casualties from the vehicle. “The driver, a man was treated for a fractured leg and a potential chest injury. He was fully immobilised and given pain relief at the scene before being conveyed to the major trauma centre at Queen Elizabeth Hospital Birmingham. The trauma doctor and critical care paramedic from the air ambulance travelled on board the land ambulance with the crew, continuing to provide medical treatment whilst en route. Wednesday 19th November 2014 – 6.30am – Steve Parry. 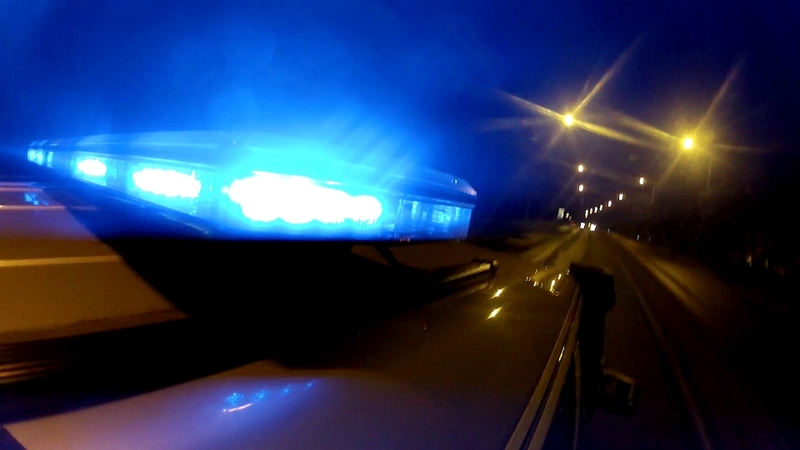 A pedestrian has died following a road traffic collision in Clayton yesterday evening. An ambulance, paramedic officer and a paramedic in a rapid response car attended to the scene. A West Midlands Ambulance Service spokesman said: “Crews responded to a car in collision with a pedestrian. Tuesday 18th November 2014 – 10.20pm – Steve Parry. Two ambulances together with a paramedic officer in a rapid response vehicle and the MERIT team attended the scene. A West Midlands Ambulance Service spokesman said: “Crews arrived to find a pedestrian had been in collision with a car, which in turn had collided with the wall of a public house. “A man believed to be in his forties was treated for serious pelvic and leg injuries. “The patient was immobilised with the use of leg splints, a neck collar and placed on a spinal board before he was conveyed to the Queen Elizabeth Hospital further assessment and treatment. A cyclist has been taken to hospital following a road traffic collision in Longton this evening. West Midlands Ambulance Service was called to a location just outside the Longton Cottage Hospital in Belgrave Road at 7.15pm. An ambulance; a paramedic officer in a rapid response car together with two BASICS doctors attended the scene. A West Midlands Ambulance Service spokesman said: “Crews responded to a collision between a taxi and cyclist in Longton. “Crews treated a man believed to be in his forties for serious head injuries. 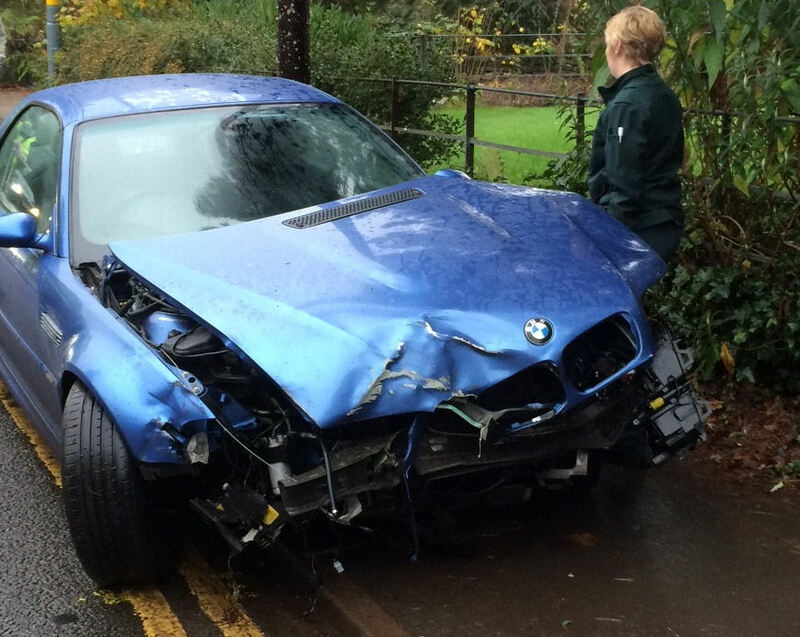 “The patient was given pain relief and anaesthetised by a doctor at the scene. Tuesday 18th November 2014 – 9.50am – Chris Kowalik. A motorcyclist involved in a collision that badly damaged his bike has escaped serious injury. West Midlands Ambulance Service was called to the B4084 at Drakes Broughton at 7.35am today. A West Midlands Ambulance Service spokesman said: “A motorbike and a car had been involved in a collision that looked serious. Sore throat, high temperature, headache, a general feeling of being under the weather. With these symptoms do you really need to call 999 for an ambulance? All this week West Midlands Ambulance Service (WMAS) is supporting ‘Self Care Week’ with the aim of helping people to take care of themselves and look after their own health. WMAS receives up to 3,000 999 calls each day. A high percentage of these patients could have treated themselves for injury or illness or referred themselves to alternative health care providers. 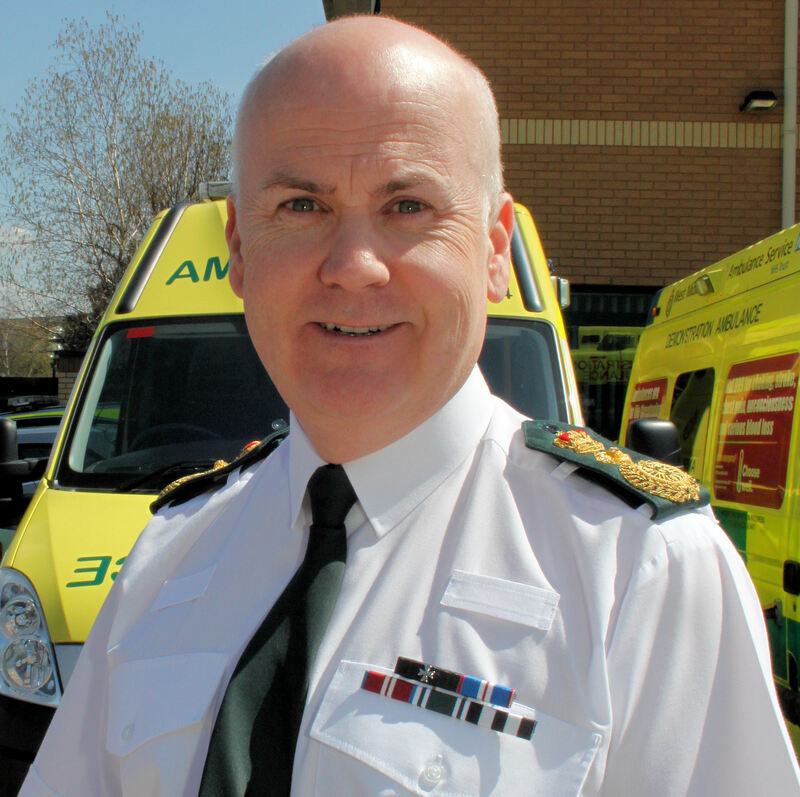 WMAS Medical Director Dr Andrew Carson is also local GP with many years’ experience of dealing with trauma patients and providing help and advice for less serious cases of injury or illness. “As medical director for the Trust and a local GP, I am aware how confusing it may seem when seeking medical help or advice when you’re unwell. “The first step is to prevent illness in the first place. I would therefore strongly recommend people get a flu jab before winter approaches. “If you are suffering a minor injury or illness you should consider approaching your local pharmacist or call NHS 111 for advice. Where your symptoms persist you should visit a Walk-in Centre or contact your GP. This year’s campaign theme is “Self-Care for life – be healthy this winter” and aims to raise awareness of how many common ailments don’t require an ambulance, and that contacting alternative health providers for advice and treatment is often your best bet. Monday 17th November 2014 – 11.27pm – Murray MacGregor. 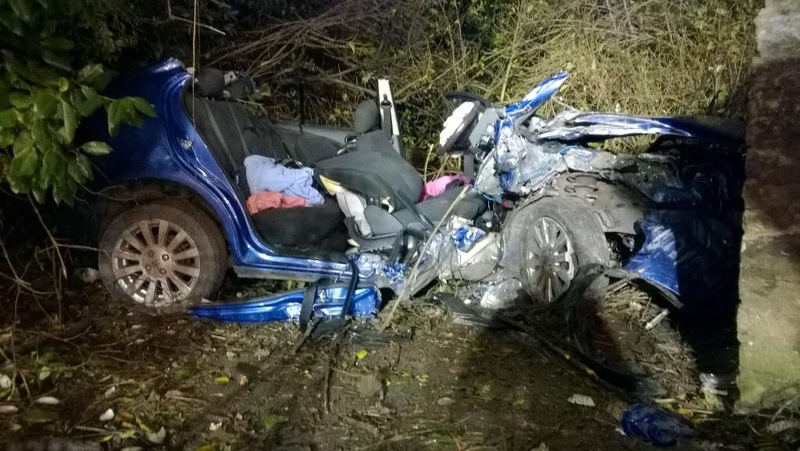 A car driver has had a lucky escape after the car he was in literally ‘disintegrated’ when it was in collision with a van in North Staffordshire. The Churnet Valley community first responder was first on scene and was backed up by two ambulances, a rapid response vehicle and a paramedic officer. A West Midlands Ambulance Service spokesman said: “On arrival, crews found a ‘transit’ sized van and a black car that had been in a collision. “The car is believed to have been a ‘cut and shut’ as it had split into two pieces, one on either side of the van. “The driver’s seat had been broken by the collision. Amazingly, the driver had only suffered a laceration to his forehead. After receiving treatment at the scene he was taken to Royal Stoke University Hospital for further assessment and treatment. “The driver of the van was uninjured, but the front seat passenger had suffered a broken nose and was taken to the same hospital. Monday 17th November 2014 – 4.30pm – John Hawker. 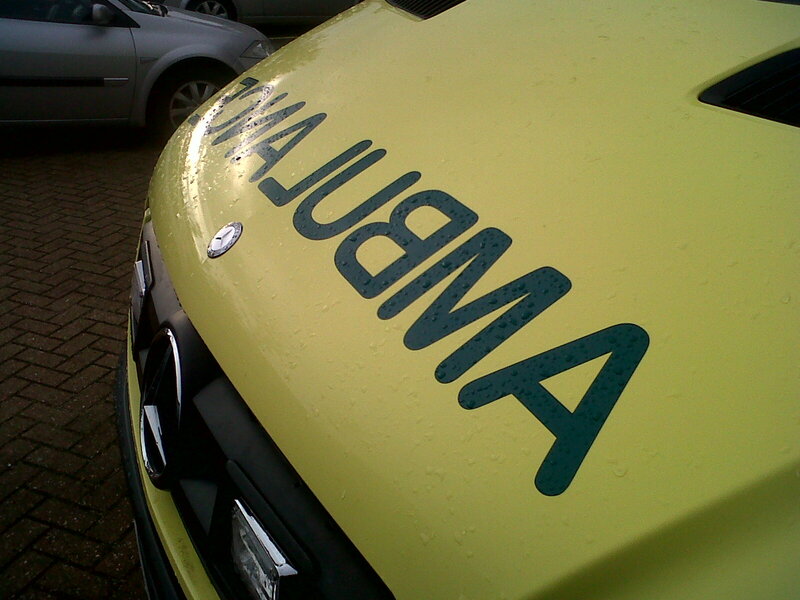 A man has been injured whilst working at Junction 4 of the M5 this lunchtime. The incident occurred at road works that are being carried out at Lydiate Ash. An ambulance, an ambulance officer, and the Trusts Hazardous Area Response Team attended the scene. The crew of the Midlands Air Ambulance from Strensham also attended the scene by rapid response vehicle due to poor weather conditions. A West Midlands Ambulance Service spokesman said: “Crews arrived to find a man who was trapped by his leg under soil that was being moved by a JCB. It is believed the side of the embankment had partially collapsed landing on the man causing serious leg injuries. “The man, believed to be in his 20’s, was released from being trapped and received emergency treatment at the scene including pain relief. Monday 17th November 2014 – 2.15pm – John Hawker. 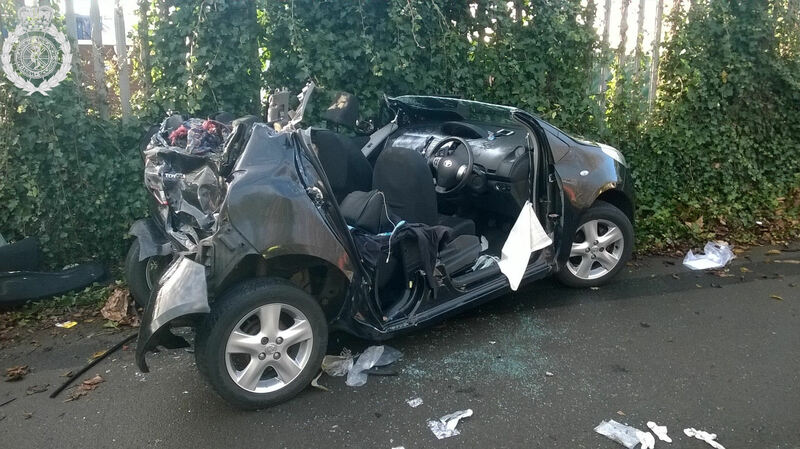 A woman was trapped in the car she was driving after an RTC in Worcester this morning. The crash occurred on the B4197, Hillside, just outside Martley at around 8.20am. An ambulance, a rapid response vehicle, a paramedic officer and the Midlands Air Ambulance from Strensham attended the scene. A West Midlands Ambulance Service spokesman said: “Crews arrived to find a car that had rolled over and come to rest on its roof. The woman driving was trapped in the vehicle. “The woman, believed to be in her late 20’s, received emergency treatment at the scene for serious scalp and facial injuries. Her condition was stabilised whilst she was extricated from her car with the help of the fire service. She was trapped for around 45 minutes. Monday 17th November 2014 – 10am – Steve Parry. 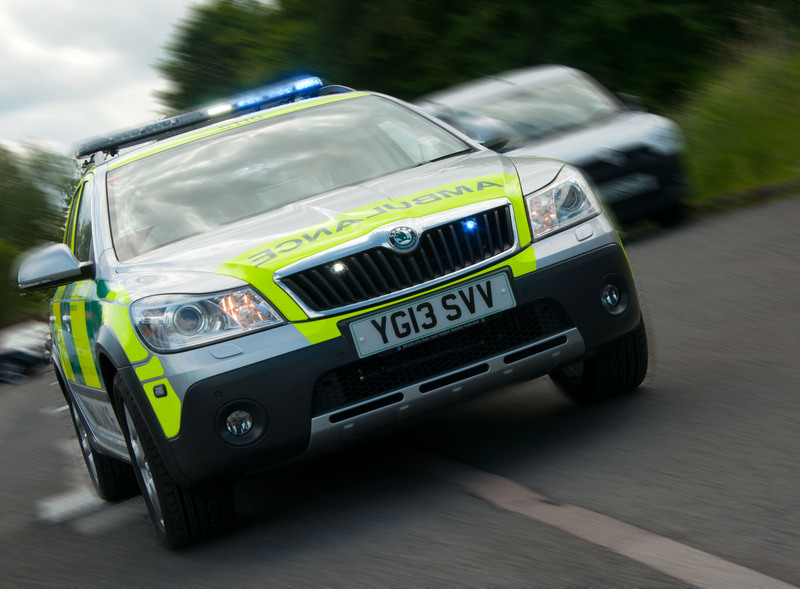 A female has died in a road traffic collision near Stretton this morning. West Midlands Ambulance Service was called to the incident on A49 near Sandford Avenue at just before 7am. Two ambulances together with a paramedic in a rapid response vehicle and the Midlands Air Ambulance from Cosford attended the scene. A West Midlands Ambulance Service spokesman said: “Crews attended a road traffic collision involving a lorry and pedestrian. 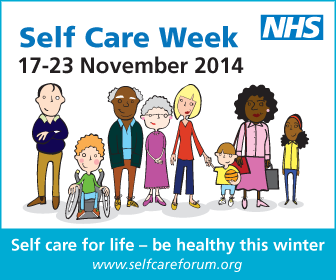 West Midlands Ambulance Service (WMAS) is supporting ‘Self Care Week’ which takes place from 17th – 23rd November with the aim of helping people take care of themselves and look after their own health. Assistant Chief Ambulance Officer, Mark Gough, said: “As we approach the festive period, traditionally our busiest time of the year, the pressure on our 999 service becomes immense. A man has been taken to hospital after his car collided with a milk lorry in the Hockley area of Birmingham earlier today. 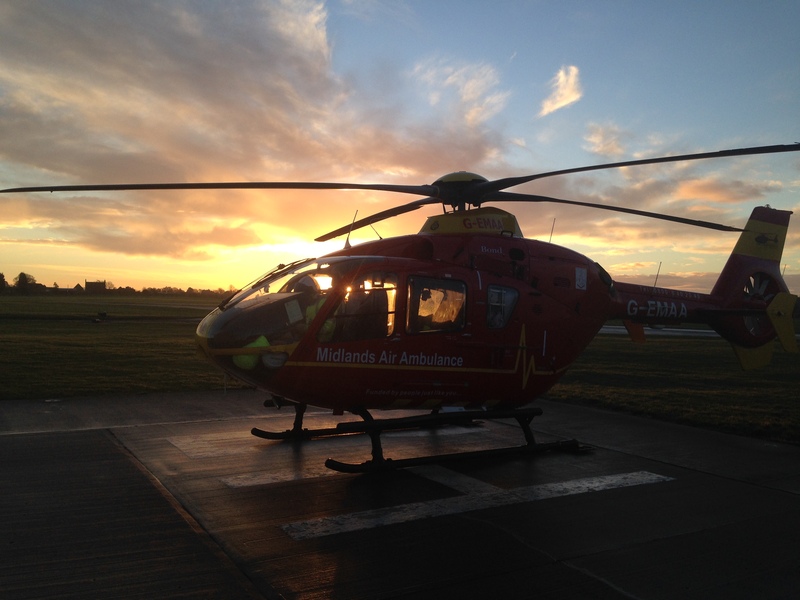 West Midlands Ambulance Service was called to Spring Hill, Hockley at just before 5am. An ambulance, together with a paramedic officer in a rapid response vehicle, two paramedic responders and the MERIT team attended the scene. A West Midlands Ambulance Service spokesman said: “Crews treated a man believed to be in his thirties after his vehicle collided with a milk tanker. “The patient was trapped in his vehicle which was significantly damaged. “The patient was treated for serious ‘life changing injuries’ including leg fractures, chest and back injuries. He was immobilised with the use of a neck collar, splints and spinal board and given analgesia before being taken to the Queen Elizabeth Hospital in Birmingham. In a separate incident in the City, a pedestrian was taken to the Queen Elizabeth Hospital by ambulance after a collision with a car. The incident took place in Paradise Place at 2.20am. A man in his twenties was treated by an ambulance crew and MERIT for a serious head injury. Saturday 15th November 2014 – 7pm – Steve Parry. 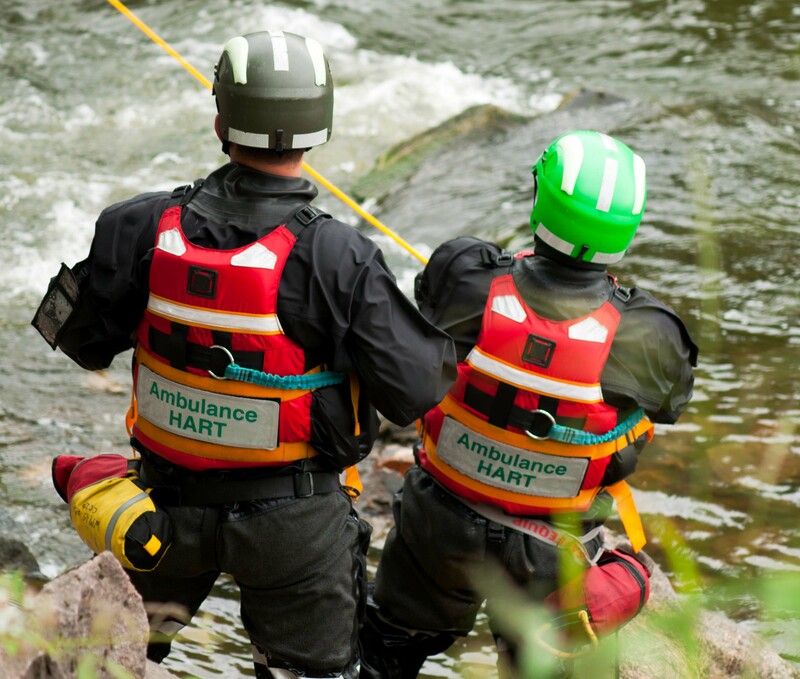 A man has been rescued from a cliff face at a Black Country beauty spot this afternoon. West Midlands Ambulance Service was called to the Wren’s Nest National Nature Reserve in Dudley at just before 1.30pm. An ambulance and the Hazardous Area Response Team (HART) attended the incident. A West Midlands Ambulance Service spokesman said: “Crews arrived to find a man had fallen about 10 metres down a cliff face after apparently suffering a medical episode. “A man in his twenties was treated for neck and back pain. Saturday 15th November 2014 – 1pm – Steve Parry. A woman has been taken to hospital after her car left the road, went through a hedge and fence before careering down a 50 foot embankment. West Midlands Ambulance Service was called to Seeswood Close, Nuneaton at just after 10.50am. An ambulance, a paramedic officer in a rapid response vehicle together with the Warwickshire and Northants Air Ambulance team travelling in a rapid response car, attended the scene. A West Midlands Ambulance Service spokesman said: “Crews were on scene within minutes to treat a woman in her twenties for serious head and pelvic injuries. “The car received significant damage and the patient was trapped before being released by emergency services. “Local fishermen were first on scene after they left a nearby fishing pool to aid the patient. Friday 14th November 2014 – 3.10pm – Chris Kowalik. Pioneering technology created by a Bristol-based company for a Shropshire village to help rural areas respond to cases of cardiac arrest has proven so successful, it has been adopted throughout the county and beyond. It began north of Shrewsbury two years ago with the creation of ‘Myddle Heartbeat’, a community group set-up to save lives in the village and surrounding areas. Having bought a defibrillator and been trained in its use by West Midlands Ambulance Service, the challenge for the group was to find an inexpensive and effective way of any one of the numerous volunteers being called quickly to a cardiac arrest in a rural area where mobile phone coverage is poor. The group contacted Bristol-based ‘Numbers Plus’ who adapted a telephone ring-round system originally intended for homeworkers telesales and put it to the test. The system works by giving the ambulance control room one telephone number to ring which in turn calls each of the trained volunteers in quick succession until someone answers and confirms they can go to the patient. Having proven successful in Myddle, it is now being used by more than a dozen community defibrillator schemes. The system itself will be further developed to simultaneously call all trained volunteers within a community scheme. 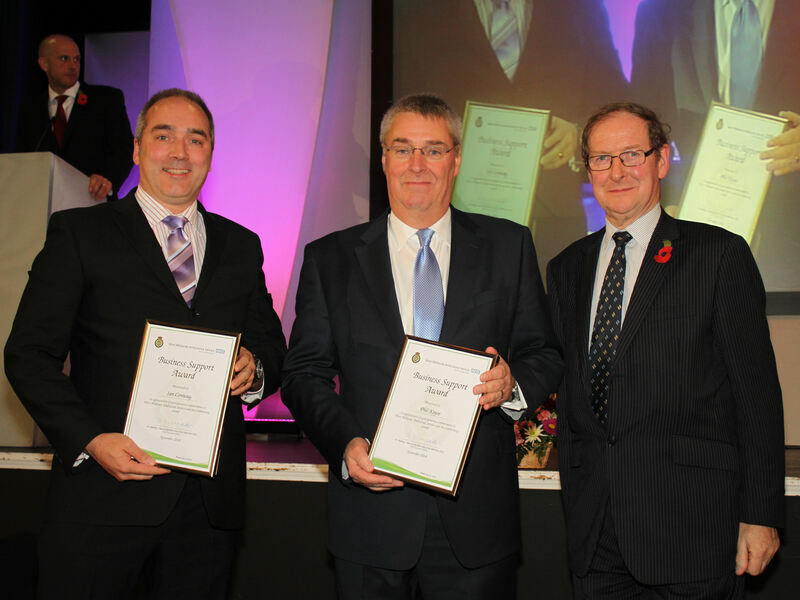 Its success was recognised with a ‘Business Support Award’ at West Midlands Ambulance Service’s ‘Excellence in the Community Awards’ ceremony at Walsall Football Club on Thursday 6th November. 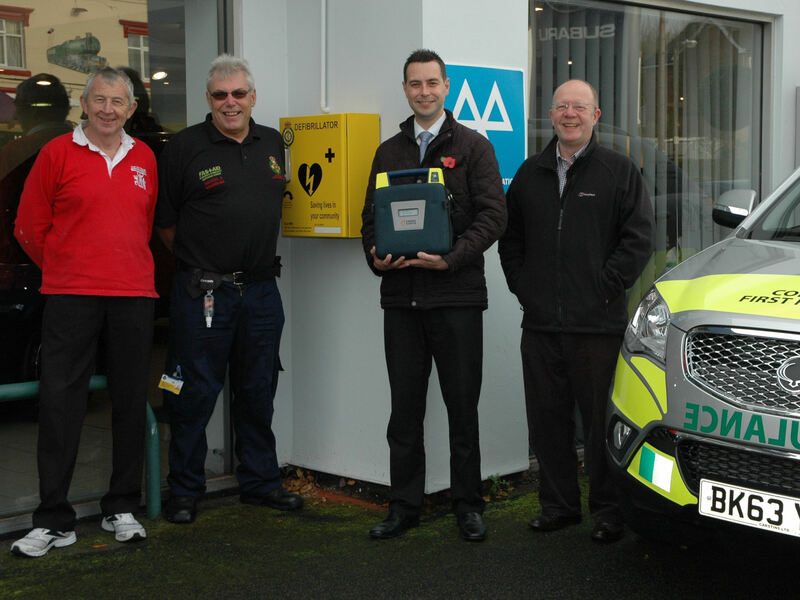 Pictured left to right: Ian Conway (Numbers Plus), Phil Keyse (Myddle Heartbeat), Sir Graham Meldrum (Chairman of West Midlands Ambulance Service). Friday 14th November 2014 – 2pm – Chris Kowalik. If you are going to suffer a cardiac arrest then one of the safest places is a busy shopping centre like the Darwin and Pride Hill Centres in Shrewsbury. Security staff there have just completed their training in the use of defibrillators (a device that can restart the heart of someone who is in cardiac arrest) – and in giving CPR (Cardio-Pulmonary Resuscitation). Community Defibrillator Facilitator Dawn Bush, from West Midlands Ambulance Service, spent a day at the shopping centres training new security staff and giving refresher courses to those already trained. Security Officer Patric Lowe, from Shrewsbury, said: “This was a refresher course for me but it is very important that we’re up to date with our training. “We have defibrillators in both the Darwin and Pride Hill Centres and thankfully I have never had to use them and I hope I don’t but if something happens then I’ll know what to do. Dawn Bush said: “Specialist training in basic life support skills can and does save lives. It doesn’t, in any way, replace emergency services but is a valuable and important resource which can be vital in the first few minutes of a life-threatening situation. “We teach people like the staff at the Darwin and Pride Hill Centres basic procedures. They are simple, effective – and they work. “What we teach is how to manage a person who’s collapsed, how to do oxygen therapy and how to use a defibrillator. “We can teach people to use a defibrillator safely in very short time. The technology has come on in leaps and bounds so you don’t require any specialist skills and knowledge – the machine will do the job for you. “People normally don’t die of a cut finger or a broken leg but you will die if your heart stops and the patient left with no immediate intervention. It’s as simple as that. Emily Rogers, of Incentive Facilities Management, Head of Security and Cleaning at the Centres, said: “We place a very high priority on training and particularly on first aid and defibrillator training. Thursday 13th November – 12.55pm – Jamie Arrowsmith. More than 60 people, including 53 school children, have been assessed by ambulance crews for smoke inhalation. West Midlands Ambulance Service was called to the M42 southbound, between junctions five and four, shortly after 10.10am this morning and sent an ambulance, a paramedic in a rapid response vehicle, a paramedic area support officer, a senior ambulance officer, two doctors and the Trust’s Hazardous Area Response Team to the scene. A spokesman for West Midlands Ambulance Service, said: “We were called to reports of a large number of patients who had suffered smoke inhalation after exhaust fumes from the coach they were travelling were believed to have started entering the passenger cabin. “A total of 53 school children, eight members of staff and the coach driver were all safely taken off the vehicle and moved behind a barrier away from the roadside. “Crews then began assessing the patients and once it was determined that no one was seriously injured, they were moved back on to the coach out of the cold. By this stage it had been determined that the coach was safe for them to return to. “Once back on the coach, the patients had their carbon monoxide levels checked, after which it was determined that no one required hospital treatment and all 62 patients were discharged at scene. Thursday 13th November 2014 – 7.40am – Chris Kowalik. A motorcyclist has been taken to a major trauma centre after falling from his bike in a road traffic collision in Staffordshire. West Midlands Ambulance Service was called to Longton Road, Stone, shortly after 7.45pm on Wednesday 12th November. A Community First Responder from the Stone scheme, a BASICS Emergency Doctor, a paramedic area support officer and an ambulance crew attended. A West Midlands Ambulance Service spokesman said: “The man who is in his sixties had a badly broken leg that was bleeding heavily. Blast bandages that are capable of dealing with such serious wounds were applied. Pain relief was administered and he was immobilised. Wednesday 12th November 2014 – 12.30pm – Claire Brown. A multi-agency initiative to help mental health patients in crisis has been rolled out across the Black Country this week following the success of a pilot in Birmingham. The triage scheme, which was launched in Birmingham in January, sees a police officer, paramedic and mental health nurse respond to 999 calls where people need mental health care. Over 2,000 patients have benefitted from the scheme in Birmingham resulting in fewer A&E attendances and detainments under the Mental Health Act by the police. The Black Country scheme, which launched today (Wednesday 12th November) will operate out of Bilston Police Station every day and is jointly funded by Black Country NHS Clinical Commissioning Groups (CCGs) in Dudley, Sandwell and West Birmingham, Walsall and Wolverhampton. Nick Henry, Black Country General Manager, said: “This is a great initiative to improve the service response to this patient group, allowing us to work closely with our colleagues and most importantly improve the patients experience in their hour of need. The dedicated team helps to free up ambulance crews to respond to other 999 calls enabling the service to provide the right care, to the right patients at the right time. The scheme is a great success and is an excellent example of how partnership working can make a real difference to patients.